Sustained, albeit slowing, global economic growth, OPEC supply cuts, the U.S.’s renewed sanctions on Iran, and declining output in Venezuela and Libya are just some of the factors that have been helping turnaround the energy sector. At the same time, high dividend yields offered by some individual stocks in the sector have potentially attracted new investors in an interest rate environment where 10-year Treasury yields still hover below 3 percent. For Q2, the energy sector is expected to report 23.8 percent year-over-year revenue growth and 142.5 percent earnings growth, according to FactSet. That high projected earnings growth rate is largely a result of low earnings in the same quarter last year, as well as a sustained recovery in oil prices. WTI Crude started the year in the low $60 range and has been trading around $74 in July. Brent Crude, the global benchmark, was trading at $77.72 this morning, up from $66.57 at the start of the year. 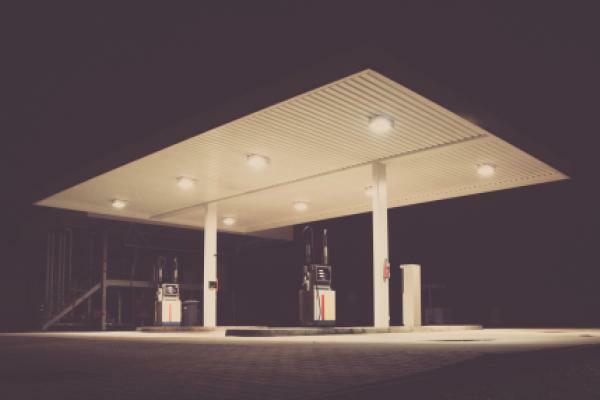 The price of natural gas, on the other hand, which is a sizable portion of the oil supermajors’ businesses, remains well below its winter peak of $3.63 and has been trading in the $2.60 to $3.00 range since February. While geopolitical tensions typically don’t bode well for the broader market, the energy sector is one area where companies could benefit, as oil prices get pushed higher from shifting supply and demand. However, if tensions increase, supply and demand can become more erratic and it could have a disruptive force on the market. Beyond geopolitics, supply disruptions can always come from unexpected places and have varied impacts on the market depending on the size and length of the disruption. One of Syncrude’s oil sands facilities in Canada lost power earlier this month, halting up to 360,000 barrels per day (bpd) of production. That facility is expected to come back online towards the end of July, according to a company spokeswoman from Suncor Energy Inc. (NYSE: SU), which owns a majority stake in Syncrude. ENERGY SECTOR IN 2018. 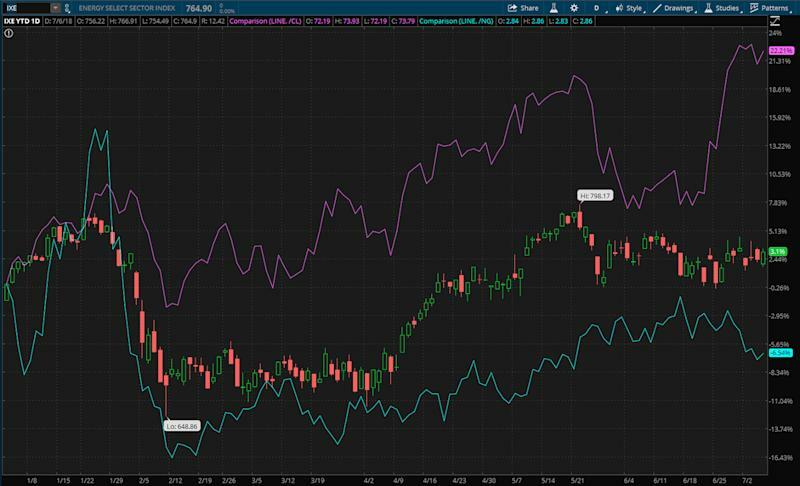 The chart above shows the S&P Energy Select Sector Index (IXE), compared to WTI Crude Oil (/CL, purple line) and Natural Gas (/NG, teal line). IXE is up 3.1 percent year to date as of July 6, while /CL is up 22.21 percent and /NG is down 6.54 percent. Chart source: thinkorswim® by TD Ameritrade. Not a recommendation. For illustrative purposes only. Past performance does not guarantee future results. Global economic growth has continued, although it has slowed in major economic regions such as the U.S., China, India and the Eurozone. For many commodities, global growth is a tailwind, potentially helping to increase demand for petroleum, natural gas and related products, which typically can help push prices higher. The strength of global economic growth going forward could play a big part in helping to keep supply and demand in balance. The U.S. Energy Information Administration (EIA) currently forecasts global petroleum production at 100.22 million bpd, while worldwide consumption is expected to be 100.29 million bpd. In 2019, the EIA expects global production of 102.21 million bpd, slightly above the forecast of 102.01 million bpd in global consumption. OPEC has been working for the past several years on bringing global supply and demand in balance to help support oil prices. At its June 22 meeting, OPEC said the group in May 2018 had achieved 152 percent compliance with its production targets set in 2016, meaning OPEC and other producers that had joined them in cutting supply had reduced production by about 600,000 bpd more than its goal. OPEC agreed to increase production in June, but there wasn’t much clarity around specifics. Instead, OPEC’s official statement said that they would focus on stabilizing production cuts at the 1.2 million barrels per day (bpd) they had agreed to in November 2016. Despite the lack of a hard number, analysts have indicated they expect OPEC to increase production by around 600,000 to 800,000 bpd, less than the 1,000,000 bpd that was expected. There also weren’t specifics about which members would increase production. Declining output in Venezuela, renewed U.S. sanctions on Iran, and other factors have helped to limit the group’s overall ability to meaningfully boost production. Countries like Kuwait, Saudi Arabia, the United Arab Emirates and non-OPEC producer Russia are some of the few that analysts think have the ability to increase supply. Some of them had already started boosting production in recent months anyways. Saudi Arabia, OPEC’s top producer, pumped 10.39 million bpd in June, up from 10.01 million bpd in May and the country’s highest output since December 2016, according to S&P Global Platts OPEC survey. Russia’s production increased from 11.06 million bpd in June to 11.193 million bpd in the first four days of July, according to Reuters. OPEC’s next major meeting will be held in December 2018. Several U.S. producers have reported a growing number of pipeline bottlenecks as production has continued to grow in the Permian Basin, an area that accounts for a significant portion of North American production. Analysts have indicated they expect pipeline capacity to remain a headwind, particularly for smaller producers that aren’t able to negotiate large contracts as easily, or invest as much in pipelines, as the bigger producers in the region. ExxonMobil Corporation (NYSE: XOM) and Plains All American Pipeline, L.P. (NYSE: PAA) announced plans in June to create a joint venture that would build a new multi-billion dollar pipeline in the Permian region. That new pipeline is just one of many that are being built in the region, but the extensive projects take time to complete. In the short term, some analysts said they expect producers to slow production in the region and potentially invest more in other U.S. regions like Eagle Ford and the Bakken.